I will begin this article by saying that trying to narrow one of the best prospect systems in hockey down to the top four is no easy task. Since joining the Philadelphia Flyers as general manager, Ron Hextall has made a point of drafting and growing talent. Through this approach he has stocked up on draft picks throughout the past couple years and has turned them into some great players. Just as some housekeeping, for this article I’ve chosen prospects that have played less than 10 NHL regular season games. This eliminates players such as Travis Sanheim from appearing on this list. Also, I’ve ranked the top four prospects based on their NHL upside not necessarily their NHL readiness for 2018. Goaltending has been the Flyers Achilles heel since… well, ever! You have to go all the way back to when the man who now patrols the press box, Hextall, was in goal to find a goalie that has been even remotely close to franchise goalie. The ironic part is that he was the one who drafted the next goalie that the team hopes will be their guy for years to come, Carter Hart. From the time he was drafted in the eighth round of the 2013 Western Hockey League (WHL) Bantam Draft by the Everett Silvertips, Hart has steadily improved his play year-over-year. He began his WHL career with 18 wins then improved to 35 the following season, then fell to 32 (10 fewer games played) and this season he is at 28 and counting. However, it is not only the wins that are impressive it’s that his goals against average has dropped from 2.29 in his first full season to only 1.53 this season and his save percentage has increased from 0.915 to 0.950. These numbers are almost unheard of. Throughout his WHL career he has eclipsed the 100 win plateau posting 113 wins and this season tied the WHL’s all-time shutout record holder Tyson Sexsmith with his 26 career shutouts. Hart has also won back-to-back Del Wilson Memorial Trophies (WHL Goaltender of the Year) and the Canadian Hockey League (CHL) Goaltender of the Year in 2015-16. 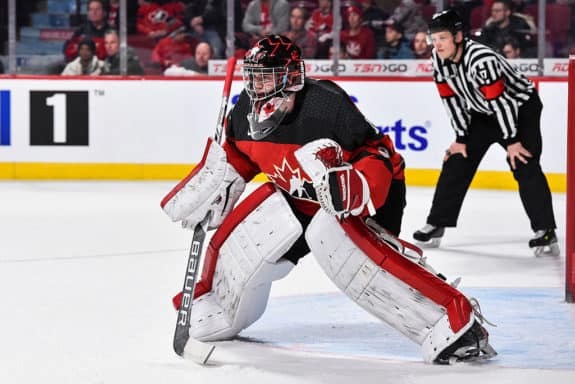 As icing on the cake Hart put Canada back in the winning column at the 2018 IIHF World Junior Championship. As a six-foot-two goaltender, Hart is quite undersized for the position but he hasn’t let that slow him down. He has performed well on all stages and will need to continue to work hard if he wants to succeed in the NHL. It may be too early to say, but I will do it anyways. The Flyers have a really good goalie in Hart and I will go as far as saying he will be the Flyers starting goalie for the 2020-21 season, if not sooner. Projected NHL arrival: 2019-20 as a backup goaltender. Over the years, the Flyers have drafted very well down the middle at times having an abundance of centremen. Wingers have been a different story. With the exception of Travis Konecny (drafted as a centre) who is currently playing on the wing, Oskar Lindblom is the only other Flyers drafted winger on the roster. In a previous article, I made a very bold stance by asking if Lindblom has the potential to be the next Peter Forsberg. Although he hasn’t produced in his first seven games as a Flyer, I still stand by the claim and think that in a full season where he can get into a routine he will be a great player. He has not looked out of place with both Nolan Patrick and Jakub Voracek on the second line and has generated a lot of offense. Lindblom is another player that has really elevated his game and has come out of nowhere. The Flyers drafted him in the fifth round of the 2014 NHL Entry Draft and thought they had a decent player but it was his performance in the seasons that followed that really made him stand out. In his final season with Brynäs IF Gavel of the Swedish Hockey League he set career highs in goals, assists and points with 22, 25 and 47 respectively. 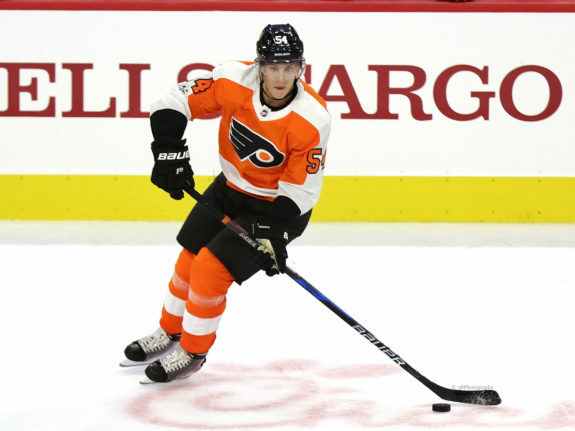 From the Swedish Hockey League he made his North American debut with the American Hockey League’s (AHL) Lehigh Valley Phantoms and has put up 41 points through his first 62 games over parts of two seasons. He caught his break in February when Wayne Simmonds was injured and has since been inserted onto the second line. With his vision and hockey IQ, Lindblom is going to be a very special player for the Flyers. He has consistently improved as a player and has really grown into a sounds two-way hockey player. Look for Lindblom to slot into the third line left winger role next season as a full-time NHL player with ice time increases throughout the season which could result in him finishing the season on the second line. Oddly enough, Philippe Myers is the only player on this list who wasn’t drafted by the Flyers or any other NHL team for that matter. In September of 2015 there was a headline that the Flyers had signed Myers but no one really thought anything of it. Perhaps more prospect defensive depth or a player with some upside but probably just going to be a career AHL player. Then you got to see him on ice and realized not only is he a towering six-foot-five but he is also a great skater. It was very surprising that no one took a chance on him considering he posted a respectable 29 goals and 63 assists for a total of 92 points through 203 career games. He was also a point per game player in his final season. The World junior’s served as his coming out party. He was invited to the camp and embraced the opportunity to ultimately win his spot on the roster. He not only made the roster but also was assigned to the team’s top defense pair with Ottawa Senators highly-touted prospect Thomas Chabot. They were dominant together serving as both an offensive pair as well as a shutdown pair. Prior to his injury in the fourth game, Myers had three points through four games. Myers began this season with Lehigh Valley and has held his own posting four goals and 13 assists for a total of 17 points through 42 games. What has been even more impressive is that he is holding onto a plus/minus rating of plus-12. At only 21 years old, look for the Flyers to clear space for him to move into the lineup next season. When you look back at the 2017 NHL Entry Draft, Flyers fans will forever remember it as the Nolan Patrick draft. Someone that is often overlooked is the other guy they drafted in the first round, Morgan Frost. Hextall could have traded Brayden Schenn at any point during the draft and there would have been willing combatants but he specifically chose to trade him so he could nab a second first round pick late in the round when Frost was surprisingly still on the board. At first glance, Frost is an undersized forward standing in at only five-foot-11, 170 pounds. However, when you look past his stature he is a very smart hockey player that can make plays. Without getting too ahead of ourselves with comparisons, he shows flashes of a slightly less gritty Konecny. Frost is very good with the puck and has terrific vision. One of his downsides (if you can even call it that) is that he is very much a pass first player. So much so that sometimes he passes off great opportunities to try to set up his teammates. 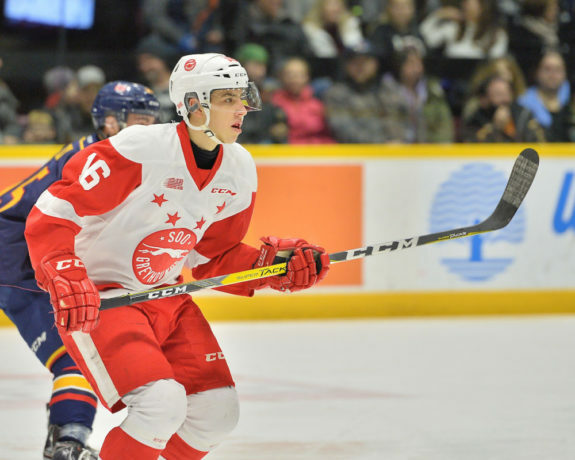 The irony in the statement about him being a pass first player is that he currently has 38 goals this season which places him in a tie for fourth in the Ontario Hockey League (OHL). He is also currently second in the entire OHL for points. Although Frost currently plays centre in junior, expect him to shift to the wing when he makes the jump to the NHL similar to Konecny. Due to his size, he will need to put on a bit more muscle before making the NHL roster. Look for him to make the lineup in the 2019-20 season. As I mentioned above, the Flyers have one of the best prospect systems in the league if not the best and as always not everyone can fit on the list. Look out for these guys to be solid players for the Flyers as well. And who knows, maybe next year they will move up onto the list. German Rubtsov has produced 14 goals and 26 assists for a total of 40 points through 44 games this season split between the Chicoutimi Sagueneens and Acadie-Bathurst Titan of the Quebec Major Junior Hockey League (QMJHL). He has had a good season but he was expected to produce a bit better this season with it being his first full season in junior hockey. 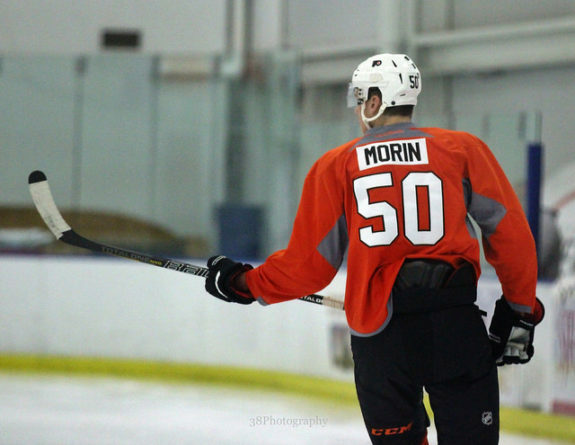 Samuel Morin has had an injury riddled season appearing in two games for the Flyers and 15 for Lehigh Valley. He was expected to make the NHL roster as a full-time player this season but injuries knocked him off track. Isaac Ratcliffe has had a great season in the OHL with the Guelph Storm setting career highs in goals and assists. He is also sitting fifth in the OHL with 37 goals. As always, I welcome your comments and if you disagree with me feel free to let me know who your top four are.